If you're looking for this week's questions for the Wednesday Hodgepodge you'll find them here. I missed strawberry picking season last year but was determined to get there this year. I had a little trouble finding the farm because I listened to the GPS but look! They put up a balloon to help me out. I made it just under the wire too, since this particular farm will wrap up their 'pick your own berries' on Friday. I remember going strawberry picking near the Jersey shore with my mom when I was a girl. Technically I'm still a girl, I'm just not a girl. A-ny-way, I needed a whole day with nothing on the calendar because I had plans to make the freezer jam I remember my mom making when I was growing up. I may have mentioned a time or a hundred here that we had an extremely wet winter, ahem. Spring was also wet wet wet so apparently the strawberry crop was smaller than normal. It was a hot day and I'd kind of forgotten that strawberry picking requires a lot of bending. Or else I forgot I wasn't eleven anymore, something like that. ....like eating pure sugar, they're so sweet. Once home I got busy washing and hulling the berries and was making the first batch of jam when I noticed a message from hubs saying a friend was in town and would be coming home with him for dinner and staying overnight. This friend is like family so hubs knew I wouldn't mind. I surveyed the state of my kitchen, my frig, and my guest room linens and decided one batch of jam was all I'd be able to manage. I have plenty of berries so I'm planning Round 2 for this afternoon. Our house guest was happy. Who doesn't love homemade shortcake with strawberries fresh from the field? Sadly I did not take a picture. Happily I did enjoy every bite. email me and let me know where you did this! thanks. That looks so delicious!! 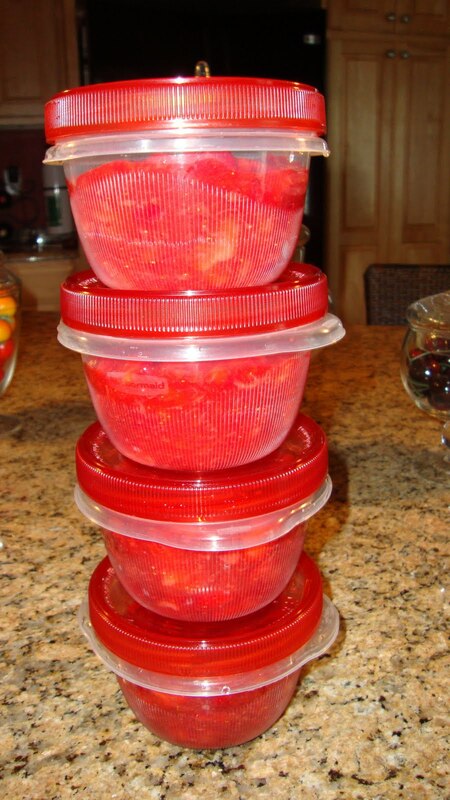 I love strawberry freezer jam. My mom always made it after she and dad would go picking berries. They loved doing that. Me? I'm trying to raise them in my garden. Last year I bought three plants. This year they've multiplied to about 100. I see lots of white berries on those plants, so I'm pretty excited! It's been years since I've made strawberry jam. Looks yummy! Fresh berries are yum! I made 4 batches of jam in November and ran out a month ago. My kids are ravenous beasts. I used to do that in the spring and now I'm sorry I still don't. That looks delicious. That bending part is what's kept me from the strawberry fields for a long time. The knees just won't allow it. So I buy mine from the grocery--and live vicariously through folks like you! Thanks for sharing! I've never heard of freezer jam, any chance you'd like to share your recipe? Teach me how to make freezer jam! Oh yes, I remember strawberry picking! The worst for me was the bug spit. :) I did like the strawberries, though. I've never picked my own put would love to make jam sometime! Looks yummy! I can´t wait to make strawberry jam too. Yours looks so yummy! What an awesome day. I forgot about doing that. I wonder if I could still find a place.